Written and transcribed by Royal Crown Revue drummer “Bam Bam” Daniel Glass, this is more than just another music instruction book. The RCR Drum Transcription Book will appeal not only to drummers interested in classic American styles of music, but also to fans who crave inside information about RCR, and music history buffs in general. Includes a foreword by the legendary Swing drummer Louie Bellson. 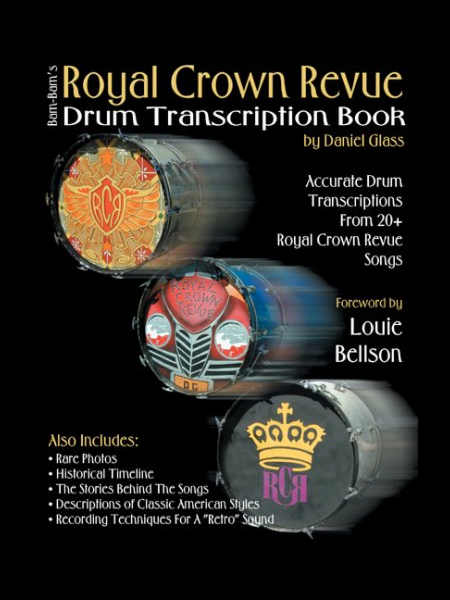 This Book Features over 110 transcribed sections from 24 tunes covering five RCR albums. Also includes detailed explanation of five major historical styles which have influenced RCR, studio and tour anecdotes, a detailed breakdown of Daniel’s soloing technique, and photos never before published.